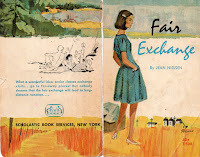 Fair Exchange is the story of a group of high school seniors who take an exchange trip from their small prairie town of Cottonwood City, Nebraska to the ocean town of Deepcove, Washington. Along the way, many lessons are learned, and, unsurprisingly, love blooms--for pretty much everyone involved, no less. The trip is dreamed up at Mrs. Kingston's storm tea. The school librarian, Mrs. Kingston is from the West Coast and hates the Nebraska storms, so she hosts 'storm teas' to help her through them with treats, music and companionship. Typing teacher Mrs. Matthew and three students are at school when the storm breaks, so they gather at Mrs. Kingston's and the idea is born. "'Oh, I just love those,' she said. 'We'll have one for our first Christmas,' Jeff agreed promptly. "Only Terri didn't study. Instead, she reached for some of the magazines nearby and settled back to read them with a hopeless, longing expression on her face. 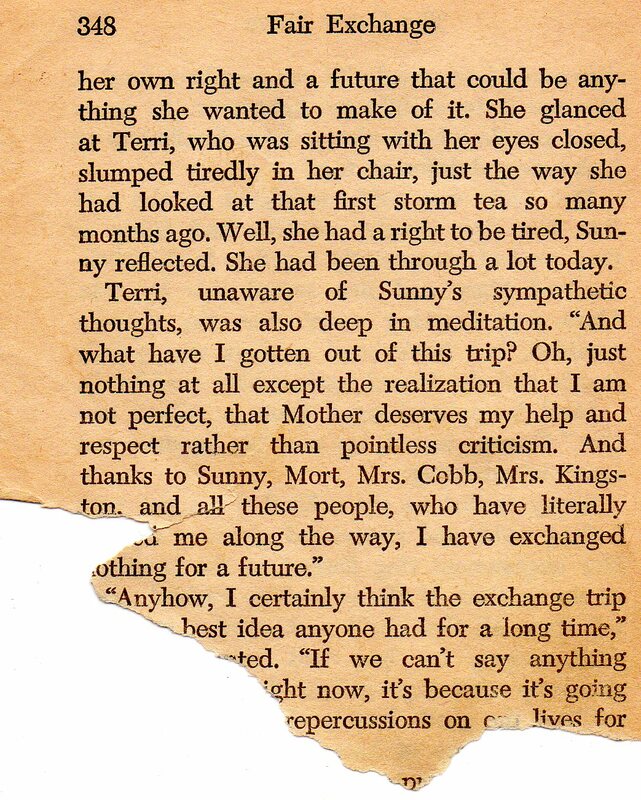 For these particular magazines were about homemaking and home decoration, and a home--a neat, clean, well-run home--was Terri's anguished dream." 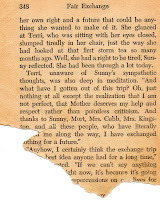 And now her mother is expecting another child, and all Terri can see is more work for her. But her brother (as well as Mrs. Kingston and Mrs. Sundstrom) is her strong supporter and helps the family see all that Terri does for them, as well as all that her mother does for the town. As for Steena, it takes her a while to come to terms with her father's new happiness. The couple plan to marry the day before the students leave for Washington. Steena thinks her father is being kind to her only because of Mrs. Matthew, but she finally realizes (at the wedding) that their loneliness had kept them apart all these years and that Mrs. Matthew will always be there to bring them together. Plus, now she can leave for the city without worrying about her father. "The door swung open violently as what seemed like an army of teen-agers trooped inside carrying small suitcases and all keyed up for a wonderful time. 'Heaven help that poor Streamliner,' the assistant replied piously." "'Oh,' she cried exultantly. For there it was--blue-gray-green swells of water cresting into white foam and spilling out on the wet, sandy beach again and again and again in cosmic precision. There was the rest of it, too, gigantic swells undulating as far as her eyes could see--as ar as they could have seen if she had had glasses on top of her glasses. Unimaginable miles away the same ocean was washing ashore in the shadow of a pagoda in China, along the jungles of South America, by some sheep farmer in Australia. The ocean--the Pacific Ocean . . .
. . . Then she was running again, half in and half out of the water, eyes shining and heart nearly bursting because somehow, half a world away from the place she had been born and lived all her life, she had found her true home." I love this, because as a young girl growing up in Minnesota within 30 miles of her entire extended family, the idea that you might belong someplace other than where you were born was an amazing one. 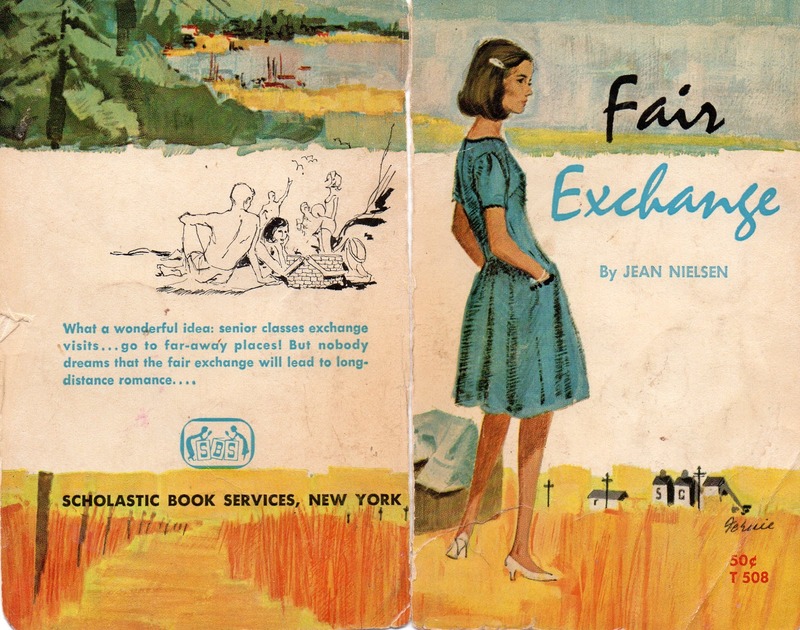 And really, kind of an innovative one for teen fiction of the 1950s. "'I'd had a fight with Jeff. That's why I was such a grade A drip all the time in Deepcove. So on the way home I decided I had to see Jeff, even if they burned me at the stake for it. I ditched the train and took a bus to where he lives, straightened things out, collected this ring, and came on home.'" "with the aid of cardboard diagrams and swatches of cloth decorated a house. This was pure joy. It was such fun to move funiture around, to choose drapes and paint colors. This was the creative side of housework, and since Terri had read so many decorating magazines and had dreamed so much of a home of her own, this project was easy and pleasant for her." This is another of my favorite parts. I totally fantasized about how I would do in this competition, having spent a strange amount of my childhood obsessed with household hints and decorating. By the way, home ec sounds like such an outdated concept, but every part of this competition is televised every day on HGTV and the Food Network. Let's reclaim the label of home ec! Yeah! "I think Ben put his finger right on what we wanted to know--that this was a worthwhile experience for you young people. Yes sir, I'd say we had a fair exchange."